If you tell your kids that every night a volcano erupts with fire, smoke, and lava right on the Las Vegas Strip, they won't believe you until they see it for themselves. Head outside the main entrance of the Mirage hotel, any evening of the week just before 7 p.m., 8 p.m. or 9 p.m. At those times, whether permitting, you can see this incredible man-made spectacle. During the winter, erruption times are an hour later (and the flames will warm you up!). Note that in not shows are offered when it's windy. If you have sulfur allergies, be sure you wear a respiratory as eruptions produce small traces of sulfur dioxide gas. There are two volcano show taking place: there's the obvious volcanic erruption complete with visual and sound effects--as well as musical scores by Mickey Hart, legendary drummer of Grateful Dead, and composer Zakir Hussain, eldest son of legendary tabla player Ustad Allah. The second show is at the lagoon level where flames and fireballs and shot 12 feet into the air. This show honors the powers of fire, water and wind. The free tram between the Mirage and Treasure Island still exists, but the free pirate show that used to draw big crowds of all ages to the TI nightly is now a part of Las Vegas history. 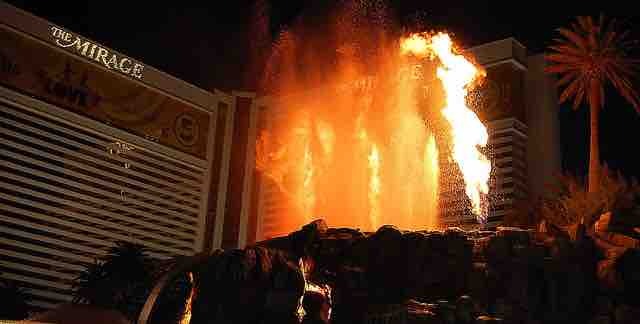 The Mirage Volcano is a must see and best of all, it's free, and because of that these shows attract a good size crowd. Get there early and give yourself plenty of time to get a good standing spot, settle in and enjoy the show. Beyond the volcano show the Mirage offers a number of great family-friendly shows and attractions. At Siegfried & Roy's Secret Garden and Dolphin Habitat you'll come up close to white tigers, bottlenose dolphins and other exotic animals (children 3 and younger are admitted free.) The Beatles LOVE by Cirque Du Soleil shows at the Mirage and if you're like us any Cirque show is worthy of attention.